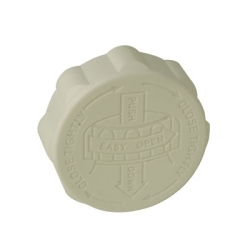 33/400 EZ-Safe® Child Resistant White Polypropylene Closure w/PE Liner | U.S. Plastic Corp. This 33/400 EZ-Safe® closure is 1.618" wide and .64" high overall. It weighs 5.4 grams. Case quantity is 2,000.